Buffalo Technology is launching a range of Power over Ethernet (PoE) network switches aimed at small and midsized businesses. The BSL-PS-G21xxM range of Smart Managed Layer 2 business switches is pitched at smaller companies, aimed at providing an easy solution for complex network expansions. The come with eight or 16 ports, with a maximum power supply of 30 watts per port. 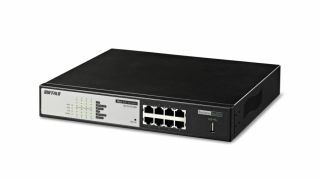 The BS-POE series of Managed Layer 2 switches is aimed at larger firms, with extra features that include integrated security settings. They also have a maximum port power supply of 30 watts, with enough capacity for concurrent use of 2.4GHz and 5GHz with 1Gbps bandwidth, and are available with eight, 16 or 24 ports. Both series include PoE profiler functions, which automatically turn the switches on and off at a scheduled time or date, and with the Loop Guard warning function, which signals when a network problem arises. Buffalo says that devices attached to the switches do not need to be within reach of a power outlet, and that only one local area network cable is required for both data and power. Other features include virtual local area network tagging and supported USB flash recovery.